Before you get married, you picture the weekends as a chance to spend some romantic time with your spouse, strolling hand in hand on a sandy beach as the gentle waves lap at your feet, or maybe having a picnic at the park. Weekends would be a special time, you told yourself, to relax, reconnect and rekindle your love for each other. That does sound nice, but the reality is, that once the weekend finally arrives, you find yourself strolling through the aisles of Costco. What can I say, being an adult also brings many responsibilities, including grocery shopping, paying bills, cleaning, laundry and mowing the lawn. Being an adult also means that you actually get giddy with embarrassing excitement while you’re “fulfilling your duties” (and spending money) at Costco. 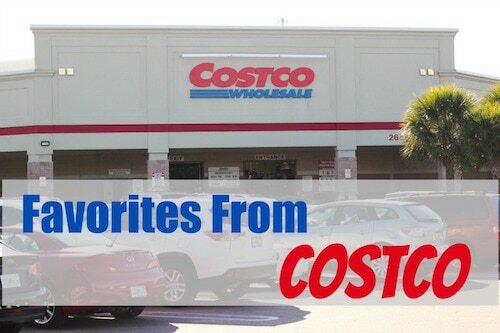 Ever since we signed up for our Costco membership, we enjoy the trip, stocking up on our tried and true favorites as well as discovering new things to bring home. We go to Costco about 2-3 times/month. Some things we buy all the time, and other things last us up to a year. Of course, since there’s only 2 adults and a baby in our household, sometimes it doesn’t make sense to buy something in bulk no matter how good the price may be. Also, just because it’s sold in bulk doesn’t necessarily mean that it will be cheaper, so you still have to look at the unit prices, to make sure it really is a good deal. 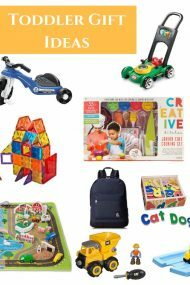 Here are some of the things that we regularly buy and the reason we renew our membership every time the year is up. We love rice. I buy both the white long grain basmati rice as well as the brown rice. Since we eat it often enough, we actually do use up the huge bags (even though I don’t usually buy more than 1 bag each/year) and it’s much cheaper than buying the smaller bags at a regular grocery store. I bake most often with almonds, walnuts and pecans. 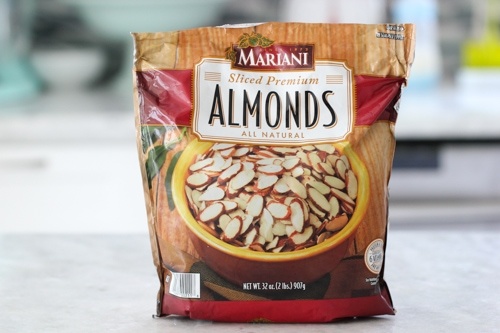 They are also Sergi’s favorites to snack on or add to salads. I buy a huge bag of each of these nuts and store them in the freezer. They last me about a year. Since nuts have a large amount of oils in them, nuts get rancid if you don’t use them up fast enough. Freezing them keeps them nice and fresh. You don’t even have to thaw them before using. Dry fruit can also be found as a good deal. They have dry sour cherries that I like to snack on as well as use in some recipes, like my Traditional Thanksgiving Dressing/Stuffing, in salads and other baked goods. Last time we were at Costco was the first time we bought dry mangos and they were AMAZING. I’ve never tasted dry mango that was so juicy and flavorful. 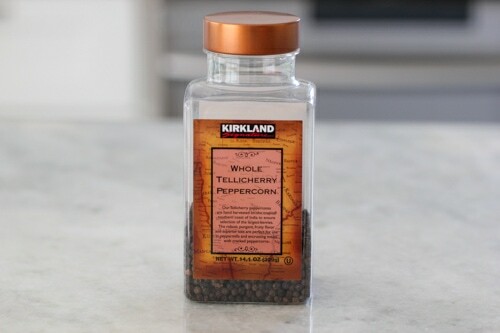 I usually buy the bulk containers of sea salt and whole peppercorns that I use when I cook broths or refill my pepper grinder. I don’t buy a lot of other spices in bulk, since I don’t want them to get old before I use them up, but if I’m cooking for a large event, they have many options, like granulated garlic and onion, Italian herbs, etc. 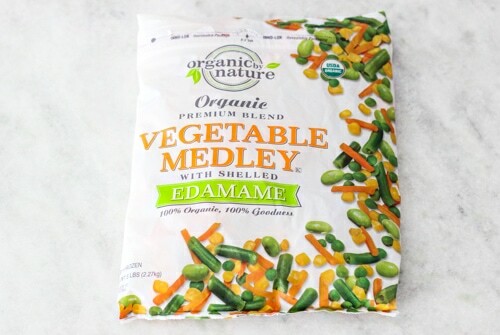 This is a combination of carrots, corn, peas, edamame and green beans. I keep this on hand for easy lunches for myself, or to cook up an emergency vegetable side dish to a dinner if I don’t have any fresh veggies on hand. I’ll be honest with you, I am not a big fan of the texture of frozen vegetables. This is a passable way of always having some vegetables available. I like to add it to leftover rice with an egg for a super easy fried rice dish. Tuna is cheap, filling and great on sandwiches, like the most typical tuna sandwich or Tuna Melts and even Deviled Eggs. I always have a few cans in my pantry. 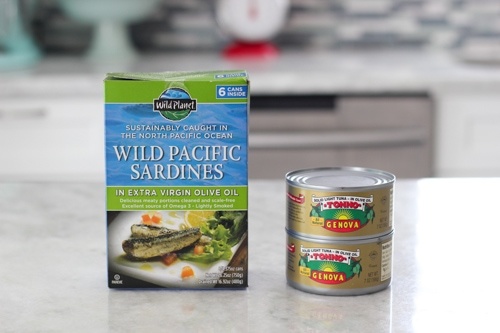 Sardines are a great source of omega 3…. My favorite way to eat sardines is on multigrain/wholewheat toast with avocado and tomatoes. We love taking tuna sandwiches with us when we go to the beach. These are both lunch favorites for me. It’s so much more affordable to buy organic milk at Costco and we really enjoy the taste of it too. 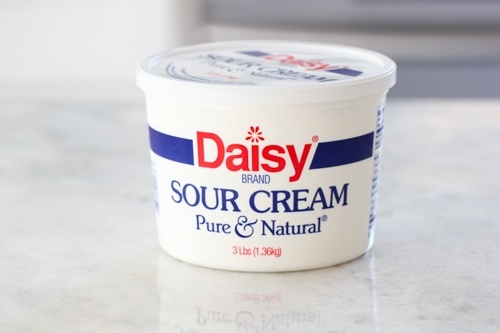 Most of the dairy is cheaper at Costco, so if I know I can use up the tub of sour cream, I get it, and the half n half and heavy cream are always a good deal. 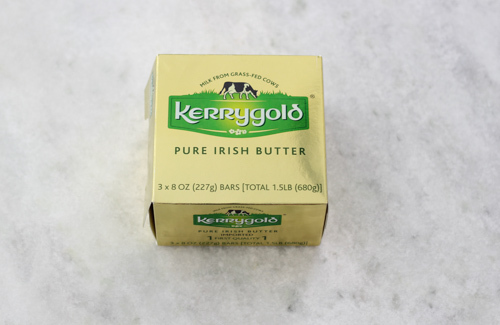 We love the taste of Kerrygold butter and once again, it’s cheaper at Costco. Are you seeing a theme?:). Maple syrup is twice more expensive at a regular grocery store. It’s a breakfast must have for us. I like cooking oatmeal and adding maple syrup for sweetness. One of Nathaniel’s favorite foods ever is oatmeal, so I’m happy to oblige. 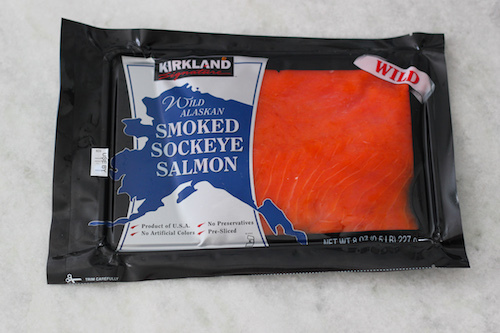 It’s hard to find wild smoked salmon in most grocery stores, but in Costco it’s always available and we pay half the price of what it would cost at any other grocery store in our area. It’s great on sandwiches, appetizers or on a bagel. 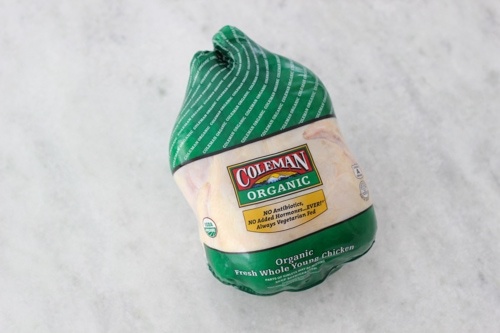 Organic chicken is very pricey, but here it’s quite affordable. I buy the whole chickens, chicken drumsticks, thighs and chicken breasts. The chicken pieces are very conveniently packaged in portion sizes, so I don’t have to spend time portioning them out myself. 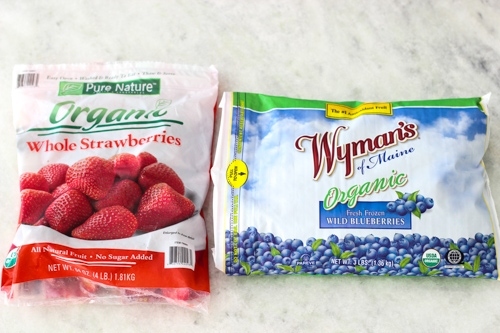 Frozen fruit is good to have on hand. Strawberry and banana smoothies are my favorite and I even make strawberry jam from frozen berries. (I just shared the recipe.) I also make cooked fruit drinks, like Mors, Kompot as well as flavored Iced Teas and Pink Lemonade using frozen berries. Frozen blueberries are great for baking. Whenever I need to bake something fast, I always have the choice of muffins or a coffeecake. 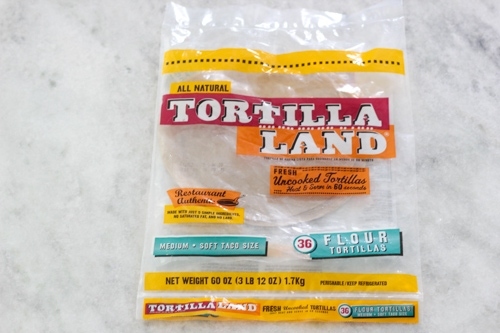 We hardly ever have these at our local Costco, but they are nice to grab when they are available to make easy Cheese or Chicken Quesadillas or Cheburecki. 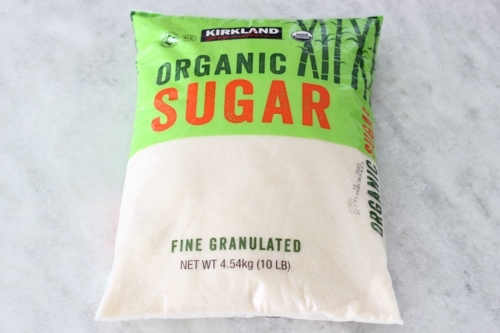 I tell everyone who buys organic sugar to get it at Costco. In our area, you will pay the same money for a bag half the size in local grocery stores and even Trader Joe’s. My mom hooked me up with olive oil and avocado oil from one of their stores in New York so I don’t have a picture of the Costco oils, but when I am not spoiled by my Mama, I buy both of these oils at Costco. You really have to know prices for fruits and vegetables, since not everything will be a good deal, but often you will find good prices for certain things – mushrooms, asparagus, berries, melons, potatoes, spinach, lettuce, etc. Costco will often have products that they sell for a short amount of time, during a specific season or run special promotions. We’ve scored so many great deals at Costco. 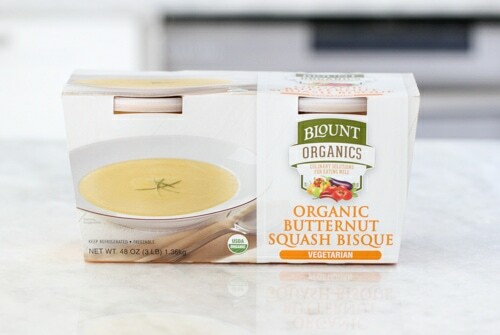 In the fall, I bought this butternut squash bisque and it was so delicious. It was a perfect lunch to have on hand for myself and Nathaniel. I really wish they sold it year round. 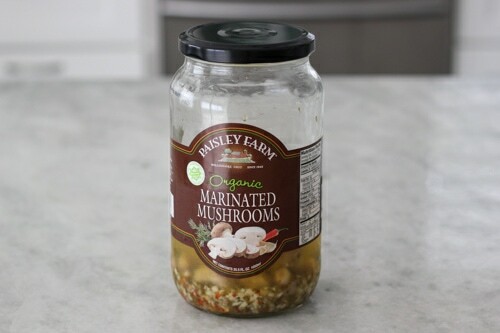 I just recently bought these mushrooms and I haven’t seen them before but they were also really tasty. I hope they keep selling them. As you can see, the jar is almost empty and as soon as I took the picture, I finished it off:). 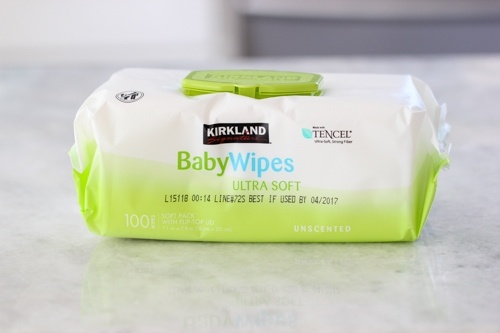 I also have to mention the Kirkland brand baby wipes. We really like them. They are nice and thick and Nathaniel doesn’t have any sensitivity to them. 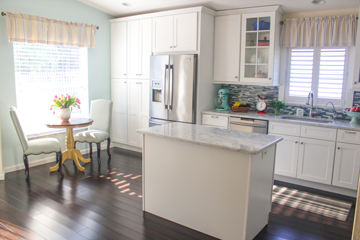 We’ve also bought many household and miscellaneous things, like books, a runner that we have in our laundry room, beautiful pendant lights above our kitchen island, our dinnerware set, cozy blankets and Nathaniel’s tricycle. I’m sure there are many more great products that we buy that I forgot to mention or we just don’t buy them often enough. Also, stores across the nation may vary with their options, so not everything that we have in our local Costco will be available at your store, just as some of the products that you enjoy, we won’t have in our store. We don’t buy everything organic, but I really appreciate that Costco has so many organic options for great prices. And who doesn’t love their sampling stations? The only downside is that it’s usually crowded on the days that they are giving out samples. 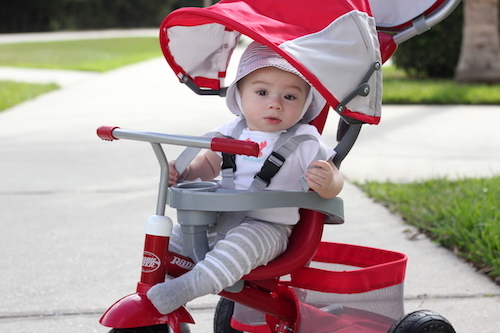 There are many really great products and we enjoy shopping there. It’s easy to get sucked in to the Costco vortex, just like it is in any store, so it’s a great time to practice self control:). Please share all your Costco favorites; I’d love to get some ideas from you. Great tip about freezing the nuts! I will have to try this out since I’m always having to throw mine out once they go bad. Some of my staples from costco are flour, sugar, powdered sugar, brown sugar, oil, and nutella (can you tell I bake wedding cakes?!) Love how long they last me and I don’t have to go to grocery store everytime I have a cake order. I used to throw out nuts all the time too, until I read about freezing them, and I’ve been doing that for the past 5 years or so. It saves a lot of money, since nuts are not cheap. That’s so awesome that you bake wedding cakes! Thanks for great ideas! I love Costco! However, because I shop mainly at Aldi, I buy items that have Warehouse Coupons 95% of the time! For example, diapers and wipes have coupons every other month (sometimes two months), so I’ll grab those to last me 30-60 days. Same goes for laundry detergent and Oxy Clean. I like to buy snacks on sale as well (perfect for kids lunches, birthday parties, etc) and Greek Yogurt (you get the picture). My sister shopped at Costco for years, but never paid attention to coupons. After I showed her, she was able to save $50 or more on the items she would have bought anyways! I shop at Aldi all the time too. I actually shop there almost every week, and much more often than at Costco. Maybe I sure share my Aldi favorites too:). Thank you for sharing your tips about the Warehouse Coupons. I really enjoy shopping at Costco too. It’s usually a one stop shopping trip for me, and since I work there (but in one of the Oregon locations) I don’t have to drive the extra distance to buy the essentials of a weekly shopping trip. That is really convenient:). I’m sure you get to see all the good deals and new products. How fun! 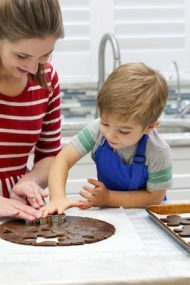 There are five people in my immediate household , 3 kids under 9 , my husband and I . I found food shopping at Costco is great when I host a large party , otherwise it not so cost effective for my family. I also like to buy there eye solution and protein bars. I would also recommend to buy there some items for the house. This summer I bought a garden hose , after several uses I discovered a tear. I brought the hose back to Costco , the customer service took it back and refund my money. No questions or problems. I love their return policy. I agree that you have to watch if something is cost effective to buy. We have just my husband and our baby son in our household, so many things aren’t cost effective and I buy them in other stores. 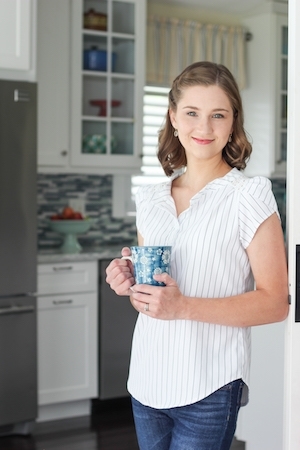 However, there are so many options that store well, like dry goods or can be frozen. I also love their customer service. That’s really a big plus:). We also buy a lot of things for our house there, just like you. Costco is my favorite store! I go there at least once a week – I love buying fresh berries, fruits and vegetables there. The quality is great! Prices are good too. I trust everything I buy in Costco. I love friendly service ( compare to SAMs club where we usually go once a month). 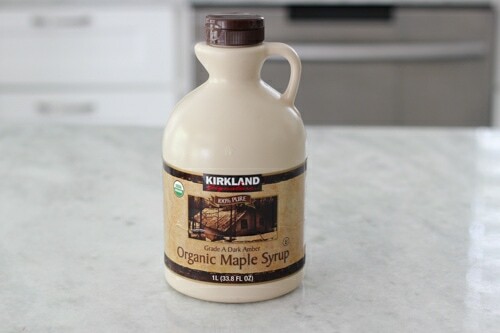 I love the fact that Costco is bringing more and more organic products. It is very nice considering the higher prices at regular grocery stores. I buy all my household items there ( laundry detergent, kitchen stuff etc). I bought all of my vacuum cleaners (three) at Costco at a great price! Half of the furniture in our house is from Costco! Their variety of healthy snacks is great! Dark chocolate covered nuts, salty snacks, jerky ( seriously Kirkland brand is the best!). Computers, jewelry… We buy a lot! And we love that at the end of the year we get 2% back from Executive membership ( that pays for itself and leaves some left for at least one shopping at Costco), and with Amex through Costco you get even more money back! Love Costco! There are so many good deals and lots of benefits, aren’t there? Thank you for taking the time to share, Dasha. I agree with you that it’s so nice that Costco has such a big selection of organic things for a great price. Shop there every other week, my family absolutely love their breads, bagels and deserts. Usually I shop with a coupon book and save average $25. That’s great, Mariyka. Coupons are awesome. I love getting good deals. I am a Costco fan, too. In addition to what you wrote I like their office supplies, clear storage containers, laundry and dishwasher detergents, paper towels, tissue paper, napkins, body wash, kitchen towels and non-scratch sponges. Also get some things from business Costco. Don’t really like their fruits, mostly don’t get any of their “heat and eat” stuff, we don’t eat that. I always get lost (in a good sense of this word) in their book section, often get something for my kids, who “swallow ” the books one after another. Toys for Christmas presents for all my nieces and nephews are very affordable too. Sorry, I wrote too much, but surely this is not all I buy there. Thanks for sharing your favorites with us. Thank you so much for sharing, Olga. You could never write too much – I love reading comments:). I also love their books and children’s toys. We were browsing through those aisles at Christmas time and that’s how we stumbled upon the bike for Nathaniel. I place the nuts in their store package into a freezer ziplock bag. You can also place them into thick plastic airtight containers. The idea is to keep the nuts as protected as possible, since you don’t want them to taste like your freezer:). That is so cool that you are from Ireland. Yes, Kerrygold butter is awesome! I don’t know of any other Irish products, but I’, always curious to try things from other countries. Thank you so much for visiting my blog. Great post. What do you use avocado oil for and how does it taste? need to check it out. I love Costco. They have a great deal on fresh fruit, persimmons, watermelons. They have the best deals for cased water. I use avocado oil for almost anything. It’s very mild flavored – it doesn’t taste like anything to me, and it has a very high smoke point, so you can use it for sautéing, frying, roasting, etc. You can even use it in baking, since it’s very mild tasting. 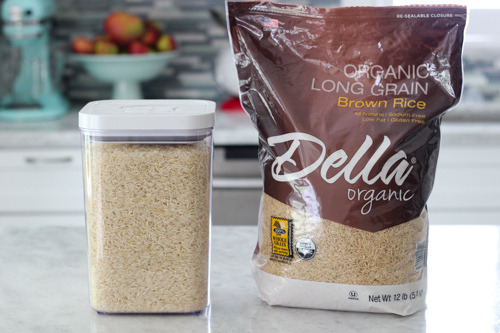 Hi Olga, I decided to buy the Della brown rice, first time, usually I only use white rice. I made plov with it. And I noticed how different it is from the white rice. I didn’t like the way it turned out. Its not the same as using white rice for plov. Anyways, I have the bag of rice and I want to try it again. How do u cook it? Do all your rice recipes use this rice? Any recipes? I noticed this rice cooks longer and its different taste and texture. Kind of taste like barley to me. Oh, no! I’m so sorry to hear that, Yelena. Brown rice will definitely not work for the Plov recipe that I posted. If you want to make Plov with brown rice, you will need to cook it differently. Olga, do you buy flour and sugar at Costco? I am always hesitant to buy a big bag of flour because, even as much as I bake, I am afraid it will go rancid in such quantities. I was wondering if you have had any experience with that? Another thing to keep in mind about shopping at Costco is whether your house has sufficient storage for all the bulk items you buy. We have a second fridge and also an additional storage room for non-perishables, but when I didn’t, shopping large quantities was not really cost effective. No, I don’t buy sugar and flour at Costco. I don’t use that much to justify buying such a huge amount, and I don’t have anywhere to store it either, so I totally agree with you about considering if you have enough storage space. I shop at Costco every week and it’s number one store we shop for 2 adults and 4 kids (1 is infant). WE buy organic if its available such as apples, eggs, salad mix, baby spinach, baby carrots, squash/zucchini mix, frozen berries for smoothies, chicken thighs, chicken breast, ground beef, humus, chips, snack bars, bottle water, diapers, paper towel, toilet paper, wipes, Ziploc bags, dishwasher detergent, gluten free bread, david’s killer bread, honey, spices, oils, toothpaste, shampoos, clothing, kitchen stuff (silverware, glasses, salad bowls, mixing bowls, Vitamix, etc). I love that their seasonal stuff changes so toys, sports equipment, etc are also something we buy. Love their return policy too and if you buy something that you don’t like even after you tried it they take it back without receipt. Also, if the price went down in 30 days that you purchased you can get the difference refunded if you have original receipt and go to their Customer Service. Oh, car tires also go on sale few times a year so we take advantage of that and their Gas. We don’t have Aldi’s in Seattle, WA area so Costco is my top store I shop followed by Trader’s Jo and Fred Meyer. Been shopping there for 14+ with my hubby ever since we got married. Costco is great on so many levels. Thank you for sharing, Mila. I enjoyed reading about your experience. And I agree – their return policy is awesome! I’ll start keeping a list and share with you of all the things we get/love at Costco. 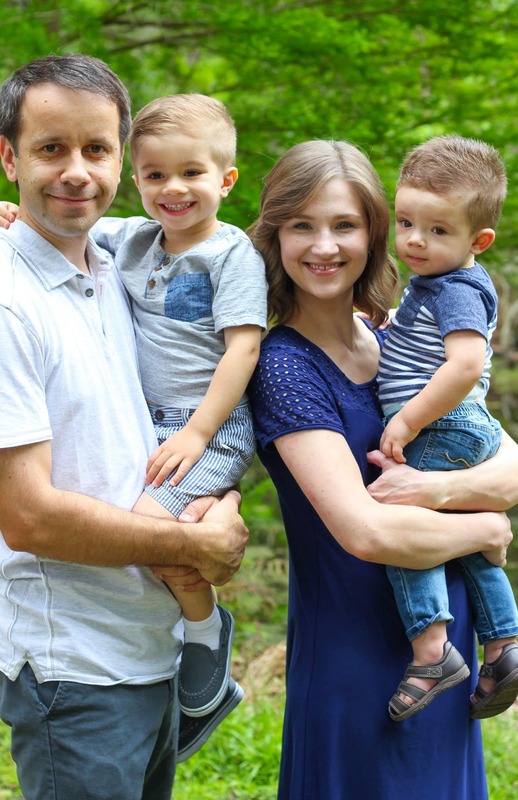 We raised 4 kids on their Diapers, their wipes are incredible! 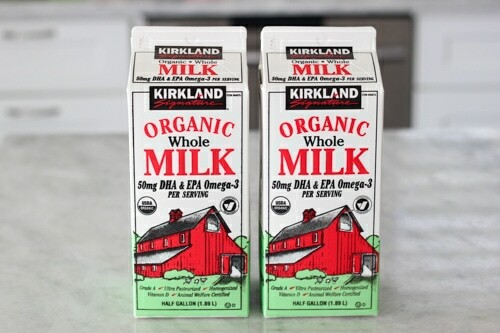 We actually don’t buy organic Milk anymore, because it’s “ultra pasteurized” – so Kirkland Signature milk has no hormones, so that is what we get. We go through 5 gallons a week, since I also make homemade Kefir with it. We use Kerry Gold butter, but also the Kirkland Signature Coconut oil – which I use for everything from skin cream to make up remover to cooking. .. The huge Heinz Vinegar container is only $3 something and we use it for cleaning primarily, but when I make okroshka, it comes in very handy. 🙂 Off the top of my head, here are some of our favorite staples – Kirkland signature organic eggs, Kirkland Signature Whole Milk – gallons, Daisy sour cream, Jimmy Dean natural 3lb sausage, the organic flour (don’t remember the brand), their spices are fantastic, Smoked salmon of course, Hellmann’s mayo, canned veggies, Pure Via Stevia, Smoked sausage Kiolbassa, avocados, onions, blueberries, celery – lots of great produce, their croissants are amazing and so are their birthday cakes. We use their optical department for the entire family and it is much more affordable than the local opticians. We buy candy for our Sunday school class by the bag from Costco. And, their gas is usually the cheapest around! Thank you so much for sharing, Natalia. Next time we go to Costco, I’ll have to refer to your list and try out some of the things that you’ve recommended. We find so many things that we love and use all the time. Costco is such a great store for our family. Thanks for sharing this! I would love to read about your Aldi favorites too. Aldi is one of my favorites. 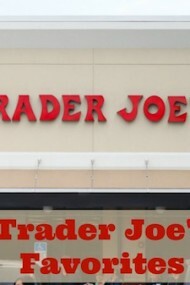 I go there much more often than Costco or Trader Joe’s, so I should definitely take the time to do another post:). Better than bullion beef and chicken, Easter dresses for girls, shampoo and conditioner organ oil brand and many many more items you ladies already posted and of course I never miss food court it’s a must!